Here, we report a case of severe anaphylactic reaction in an 18-year-old male, a known case of cerebral malaria. The investigation of the transfusion reaction was carried out retrospectively, which revealed a significant elevation of serum IgE and IgG detected by gel column hemagglutination. This case merits reporting because of its classical presentation of severe anaphylactic reaction in a non -IgA-deficient, IgE- and IgG-mediated platelet transfusion recipient. It also emphasizes the role of prospective and complete investigation of transfusion reaction in mild allergic reactions. An 18-year-old male patient presented with the signs and symptoms of continuous, high-grade fever without chills and rigors since one week. He also had associated vomiting, altered sensorium, and was unconscious with delirium of one-day duration. On examination, the patient was unconscious, pulse: 82/minute, respiratory rate: 14/minute, blood pressure (BP): 110/60 mm of Hg. On auscultation, S1 and S2 were heard, and lungs were clear. There was no organomegaly, but tenderness in the right hypochondrium was present. Plantars were downgoing; he was started on antimalarial therapy. As per altered sensorium and deterioration, mechanical ventilation and intubation were done. Basic laboratory investigations were done. Hemoglobin was 12.9g/dL, total leukocyte count was normal with normal differential count, and there was severe thrombocytopenia. Erythrocyte sedimentation rate (ESR) was normal. Plasmodium falciparum ring forms: 1/1000 RBC were seen. Complete urine examination showed trace amount of albumin. Biochemical analysis showed elevated serum bilirubin (2.4mg/dL), alkaline phosphatase, and transaminases. Disseminated intravascular coagulation (DIC) profile showed prolonged prothrombin time (PT), activated partial thromboplastin time (APTT), fibrinogen -64mg/dL, and markedly reduced platelets. Lactate dehydrogenase was raised significantly. The patient received blood components and platelets, and requested for fresh frozen plasma in view of DIC. Transfusion therapy received by the patient from day one of admission until death was reviewed [Table 1] and the description of the anaphylactic reaction [Table 2] was taken into consideration for investigating the adverse reaction. During the same period, plasma units of the same implicated platelet components were transfused to three different patients with bleeding, without any adverse transfusion reactions. Investigation of transfusion reaction included clerical check of patient identification; labels of blood components, and grouping and typing, along with requisition forms revealed no misidentification. Visual inspection of the postreaction sample of the patient was negative for hemolysis. Pretransfusion testing done on day one of admission revealed 'O', Rh-positive blood group and negative antibody screening. On day five, the patient was transfused with 'O', Rh-positive platelets and no pretransfusion sample was available. Direct Coomb's test and IgG monospecific antibody were positive in the post-transfusion sample. In view of the positivity of the direct Coomb's test, antibody screening for any irregular or clinically significant red cell antibody was done to rule out immune-mediated hemolytic transfusion reaction. Indirect Coomb's test was negative. Antibody screening by commercial three red cell panel was also negative. Based on this workup, the possibility of immune-mediated hemolytic transfusion reaction was ruled out. Blood components as well as the sample of the patient were submitted for culture, and the result was negative for both. The activity of anti-IgA, IgG, and IgM was tested by gel column hemagglutination method. 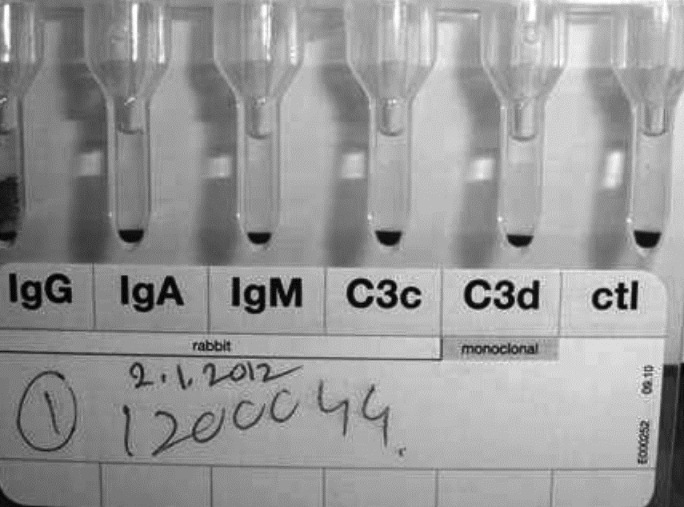 Gel column hemagglutination was positive for IgG antibodies and negative for IgA [Figure 1]. Serum imunoglobulins were measured by capture sandwich immunoassay using direct chemiluminescent technology and the results showed raised IgE antibody levels [Table 3]. Platelets constitutively express functional receptors for the Fc fragment of IgE, both the low-affinity receptor (Fc-RII) and the high-affinity receptor (Fc-RI), and could be activated via IgE. Flow cytofluorometric analysis revealed that 20% of the platelets express the Fc-RII receptor and the percentage increases up to 50 in patients with IgE-dependent allergic disorders or parasitic infections accompanied by high levels of circulating IgE. Activated human platelets release platelet-derived inflammatory mediators, such as serotonin and chemokine-like RANTES (RANTES: Regulated on Activation Normal T Cell Expressed and Secreted). It is possible that activated platelets or platelet-derived microparticles are involved in anaphylactic transfusion reactions. The high IgE levels in the serum of the patient may explain the pathophysiology of anaphylactic transfusion reaction occurring in platelet transfusions. The principal contribution of this interesting case report is in describing uncommon transfusion-related anaphylaxis by well-known mechanisms (IgE-mediated). In addition, it emphasizes the role of thorough investigation of mild allergic transfusion reactions in patients with parasitic infestation. It also explains the fact that anaphylactic transfusion reactions are mainly caused by the antibodies produced in recipients who have been transfused repeatedly. In such cases, pretransfusion testing for serum IgE and IgG levels may help in planning preventive measures like premedication, washed blood products and anti-IgE therapy to achieve safe transfusion. The authors wish to thank Mr. Mallikarjun for his technical support. The manuscript was presented in the Andhra Pradesh State Chapter, Society for Hematology and Transfusion Medicine (SHTM) and was well discussed and appreciated by a group of hematologists, pathologists, and physicians at the Nizam's Institute of Medical Sciences, Hyderabad in September 2011. 1. Sandler SG, Vassallo RR. Anaphylactic transfusion reactions. Transfusion 2011;51:2265-6. 2. Salama A, Schwind P, Schönhage K, Genth R, Cotting C, Hustinx H, et al. Rapid detection of antibodies to Immunoglobulin A molecules by using the particle gel immunoassay. Vox Sang 2001;81:45-8. 3. Shimada E, Tadokoro K, Watanabe Y, Ikeda K, Niihara H, Maeda I, et al. Anaphylactic transfusion reactions in haptoglobin-deficient patients with IgE and IgG haptoglobin antibodies. Transfusion 2002;42:766-73. 4. Buxa J, Sachsb UJ. 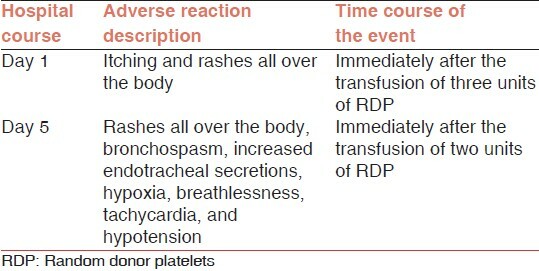 Pulmonary Transfusion Reactions. Transfus Med Hemother 2008;35:337-45. 5. Kasperska-Zajaç A, Rogala B. Platelet function in anaphylaxis. J Investig Allergol Clin Immunol 2006;16:1-4. 6. Mertes PM, Bazin A, Alla F, Bienvenu J, Caldani C, Lamy B, et al. Hypersensitivity reactions to blood components: Document issued by the Allergy Committee of the French Medicines and Healthcare Products Regulatory Agency. J Investig Allergol Clin Immunol 2011;21:171-8. 7. Ramirez MA. Horse asthma following blood transfusion: Report of a case. JAMA 1919;73:984-5. 8. Leikola J, Koistinen J, Lehtinen M, Virolainen M. IgA-induced anaphylactic transfusion reactions: A report of four cases. Blood 1973;42:111-9. 9. Domen RE, Hoeltge GA. Allergic transfusion reactions an evaluation of 273 consecutive reactions. Arch Pathol Lab Med 2003;127:316-20. 10. Perlmann H, Helmby H, Hagstedt M, Carlson J, Larsson PH, Troye-Blomberg M, et al. IgE elevation and IgE antimalarial antibodies in Plasmodium falciparum malaria: Association of high IgE levels with cerebral malaria. Clin Exp Immunol 1994;97:284-92. 11. Perlmann P, Perlmann H, Looareesuwan S, Krudsood S, Kano S, Matsumoto Y, et al. Contrasting functions of IgG and IgE Antimalarial antibodies in uncomplicated and severe Plasmodium falciparum malaria. Am J Trop Med Hyg 2000;62:373-7. 12. Joseph M, Gounni AS, Kusnierz JP, Vorng H, Sarfati M, Kinet JP. Expression and function of the high-affinity IgE receptor on human platelets and megakaryocyte precursors. Eur J Immunol 1997;27:2212-8. 13. Abe T, Matsumoto C, Shimada E, Mazda T, Takanashi M, Kawaguchi K, et al. Immunoglobulin E oligomers identified in blood components activate mast cells: Relevance to anaphylactic transfusion reaction. Transfusion 2011;51:2327-36.